TuckerBrooke Kennels, Inc. was established in 1997 and is located in Castleton, NY, a small town about 15 miles south of Albany. 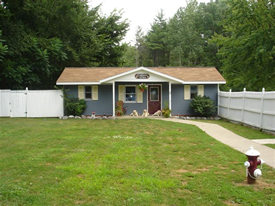 The kennels are tucked back off the road on four acres surrounded by beautiful trees and landscaped lawns. The kennel also sits right next to our home. TuckerBrooke features fourteen spacious 4' x 4' indoor runs. Each run has an access door leading to a 4' x 10' outdoor covered concrete run, surrounded by an additional 6' high fence to ensure the safety of your pet. Your pet can go in and out as they wish all day, and can enjoy the heated kennel floors in the winter or air-conditioning in the summer. The outside runs close at 10 p.m. and reopen at 7:45 a.m.
During the day, your pet can take advantage of the large fenced-in playtime area where they can play with a group of friends or by themselves. At night, they will enjoy watching numerous pet-related movies which are played nightly from 7 p.m. - 10 p.m. Please stop in for a tour of the kennel during our scheduled business hours. This email is to pay you a huge compliment on your kennel. I visited 3 kennels today in the event that no cancellations occur at your kennel for February break week. Wow, they were horrible, dark, wet, feces everywhere, awful smelling places. I guess we are spoiled by the organized, great care, nice grounds, bright, cheery and clean conditions you have. I am so impressed with you doing it the right way, I can't even believe it. What a difference! Anyway, please keep me on the waiting list. Thanks"